Spring Bulbs, Marmalade, Sulphur and Soup! 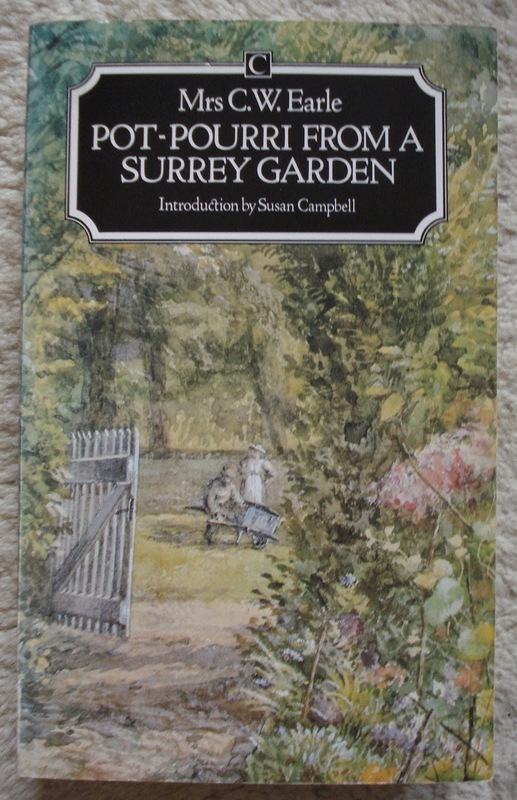 I was brought up in Surrey, and I love gardening books, so Pot-Pourri from a Surrey Garden, by Mrs CW Earle, seemed tailor-made for me, and I succumbed to its delights as soon as I spotted it (in a box of Oxfam donations, of course). 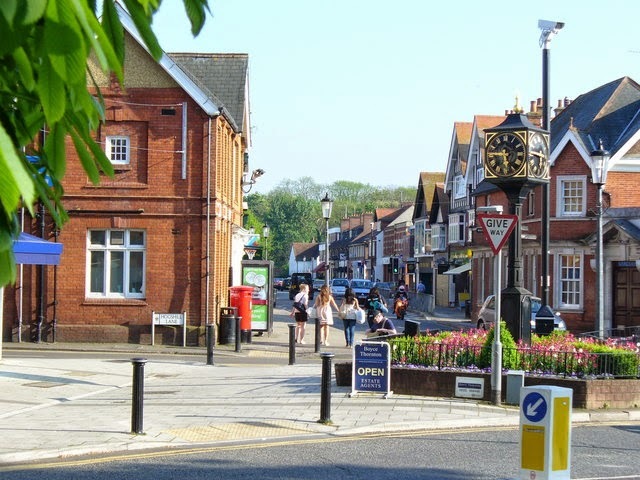 It turns out that Mrs E’s country residence was in Cobham, which I used to know a little – when I was at school a friend lived there, and sometimes I stayed at her home overnight. And it was one of the places my family would occasionally ‘run out’ to on a fine day. Usually we fortified ourselves with flasks of tea, sandwiches, and slices of Mum’s home-made Dundee cake, but I am sure we once had afternoon tea in a genteel little tea shop in Cobham (though it may have been somewhere nearby). It impressed me no end: not only were we eating out, but there were proper waitresses, and it was definitely a step up from the local fish’n’chip shop or the self-service A.B.C. café we frequented on trips to a neighbouring town. Anyway, I digress. Mrs Earle was the wife of Captain Charles William Earle, hence those initials. She was christened Maria Theresa, but in 1897, when her book was first published, a married woman was known by her husband’s name, a practice which has, thankfully, been abandoned. The couple spent roughly half the year in London, and half at Cobham, which had a two-acre garden where Mrs Earle spent much of her time. She seems to have been a knowledgeable and ‘hands-on’ gardener, but there’s more to her book than gardening. It also covers cookery, holidays, housekeeping, families, education, furnishing, customs, history, health, poems, books, weather and all kinds of other things. I guess it was one of the ‘self-help manuals’ of its day, which makes it great fun, and it’s interesting to see how things have changed. However, much of her advice (especially on gardening) still holds good, and many of her observations remain as pertinent today as they were then. She provides a lively and often humorous picture of life at the very end of the 19th century, and is informative and opinionated, without being didactic. On the whole she’s surprisingly modern in outlook – apparently her family regarded her as a great radical – and she has a sense of fun, and curiosity about life. I am not going to write a gardening book, or a cookery book, or a book on furnishing or education. Plenty of these have been published lately. 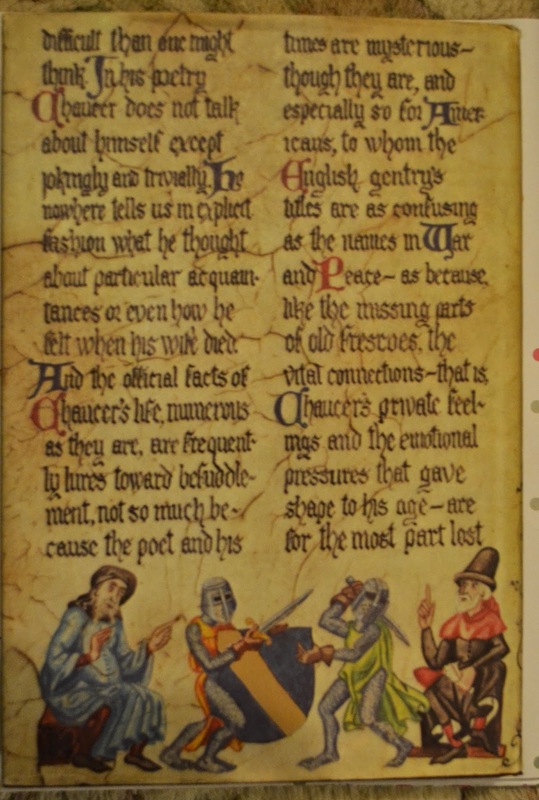 I merely wish to talk to you on paper about several subjects as they occur to me throughout the year; and if such desultory notes prove to be of any use to you or others, so much the better. But, she says, gardening will be given ‘preponderance’ throughout the book, and so it is. courtesy of Wikipedia and their Creative Commons licence. I was going to try and give a resumé of the whole volume, but decided it would be nicer to share her thoughts on February (since it is February), and maybe take another look at her later in the year. This, she says, is the month of forced bulbs – ‘hyacinths, tulips, jonquils and narcissuses’. 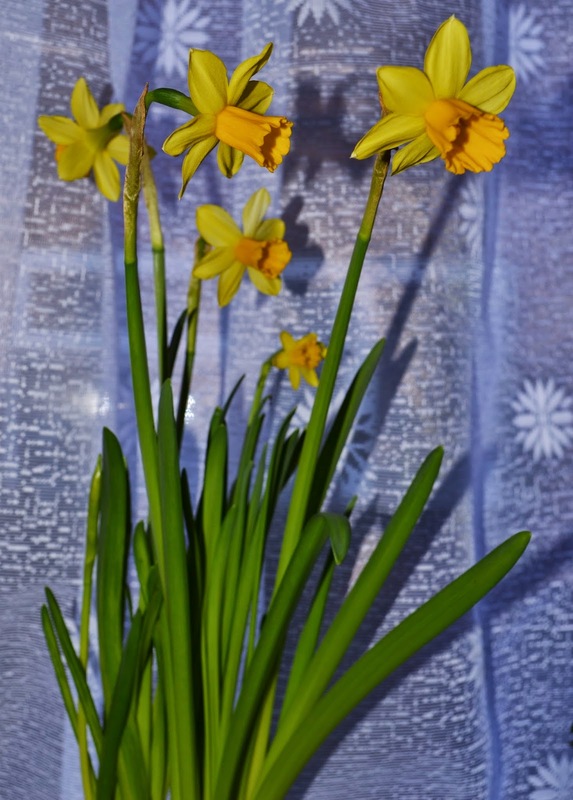 And she is absolutely right, because my little narcissi have all burst into bloom, and there are beautiful, cheerful, bright yellow flowers on the windowsills, making me feel that perhaps spring is on the way. My narcissi (in bright yellow pots, to match the flowers), were already poking their shoots through the soil when I brought them back from the local garden centre, and I feel a bit of a failure because I had some bulbs and forget to plant them back in November, which is when Mrs Earle, says you should do these things. In the Greenhouse. Or the Cellar. I was a bit flummoxed by this since we possess neither a greenhouse nor a cellar, but further reading revealed that a south-facing windowsill is fine. Actually, I’m pretty sure none of our windows face south, but the narcissi (I am positive this is the correct plural)) are flourishing, so presumably they don’t realise they’re looking the wrong way. alas, but they seem quite happy. She also mentions the Royal Horticultural Society’s early spring exhibition in the Drill Hall, Westminster, an event she describes as one of her great pleasures. Does this location still exist I wonder? And if so does the RHS still have a spring show there? Later in the month she reminds us that it’s time to make marmalade, and that old jars which are being reused should be washed thoroughly in clean water, without soap or soda. Then, when dry, they should be powdered with a little sulphur and wiped clean. Whoever knew that sulphur was an essential piece of kitchen kit! When my mother made marmalade, jams, chutneys, bottled fruit and so on she washed the jars and sterilised them by baking them in the oven, on thick sheets of newspaper. They belong to so entirely different a cuisine from our ordinary modest and economical receipts, that I think they may not be without interest to some people. The recipes include ravioli and gnocchi, which seems very cosmopolitan for that period, and they all appear to be very complicated and very time consuming, and are definitely not modest or economical. My own favourite, because it is so outrageous, is Pot au feu Soup. I’m a great fan of home-made soup, which is generally very simple to cook, but the instructions for this are mazing. First up there’s the ingredients: 15lbs of beef; 51/2 lbs of veal, 1 chicken, 21/2 gallons of water; 3 fine carrots; I big turnip; 1 large onion; a bunch of parsley; a head of celery; a parsnip; 2 cloves, and some salt. What size saucepan would you need for that lot? And however would you lift it? Then there’s the method. Before you start cooking, the meat has to be trimmed and tied, which may be a tad arduous, but believe me it’s a doddle compared to what comes next. On my reckoning the soup has to boil (on a fire!!!) for something like six hours. Various ingredients have to be added or removed at various times, scum has to be skimmed off, and there are different types of boilings to be done. I kid you not. There is violent boiling, and boiling on one side, and boiling ‘undisturbed, evenly and regularly’ (with the lid on). And you mustn’t let this witch’s brew boil over, even if it seems ‘inclined’ to do so. I rather like Mrs Earle’s use of the word ‘inclined’ because it makes the soup sound as if has a life of its own. Turn your back and it could take over the kitchen, like Grimm’s Magic Porridge Pot. And when the cooking process is finally over the fun really starts because you must ‘strain the soup, without stirring it up, through a strainer on to a napkin stretched over a receptacle big enough to contain the soup’. Right. Anyone fancy heaving that lot out of the pan? 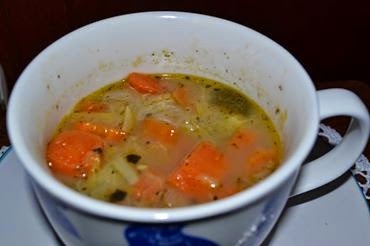 When I make soup it tends to be more Pot Luck than Pot au feu! the week… Plus fresh herbs… And stock cubes! Now I realise that the basic techniques are still pretty much the same (apart from the industrial scale of the ingredients, and the fire). But personally I think progress is a wonderful thing. All I can say is hooray for modern cookers. And electric blenders. And stock cubes!!! 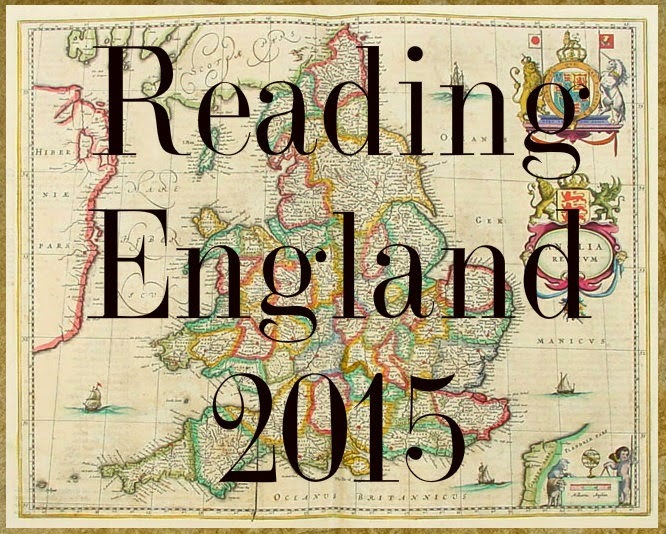 PS: I’m linking this to the Reading England Challenge, over at Behold the Stars. The aim is to travel England reading, and read at least one classic book per however many counties of England you decide to read. I think this definitely counts as a classic, and since non-fiction is allowed this would seem to be an ideal entry for Surrey. I’m signing up for Level 3, and hoping to read between 7 and 12 books for this challenge, which sounds reasonable, but it would be wonderful to cover every county. There Will Be No New Books…. I am the first to admit that volunteering in an Oxfam Book Shop is not necessarily the best of activities for someone who has resolved that there will be No New Books. But the other volunteers are so nice, and our customers are unbelievably lovely… And, of course, there are the books. I’m like a child let loose in a sweet store. The shop, as you would expect, is packed with shelves, all full of books, and if there were no customers to be served I could spend all day browsing. But it’s the back room that I love the most. This is where we sort and price the donations, and there are books everywhere, crammed onto storage shelves, as well as the table, the desk, the packing area and, occasionally, the chairs. And there are days when you can hardly see the floor for the pile of book-filled bags and boxes that dominates the room. It’s surprisingly satisfying to establish some kind of order amidst the chaos, and there’s a sense of achievement in unpacking a rare or unusual book. But best of all, because I’m really rather selfish, is the thrill I get from finding a book that’s been on my Wish List for what seems like ever and ever. I really can’t pass up the chance to buy a Must Have volume, despite that resolution about not buying new books, which was made partly on the grounds of economy, and partly on the grounds that we have no room. Anyway, I was so excited when I spotted these yesterday that I just had to have them – and, as I always say, second-hand books are not new, so they don’t count! 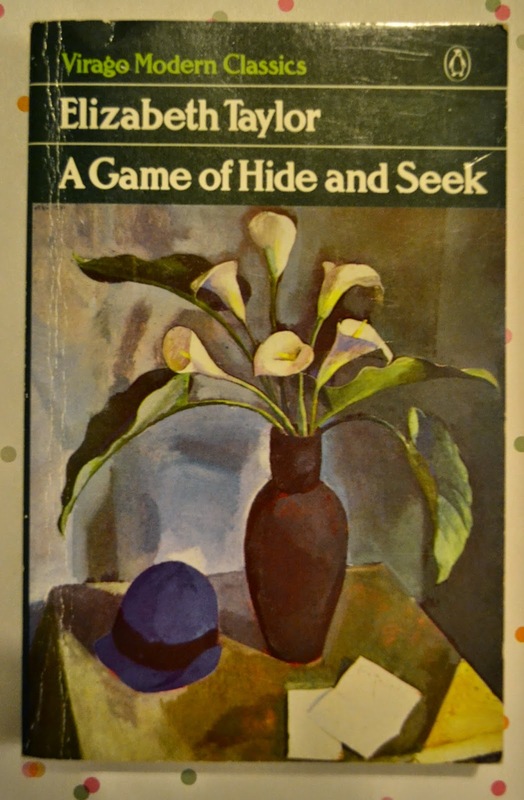 First up is Elizabeth Taylor’s A Game of Hide and Seek, in this wonderful old VMC edition, with a cover featuring Karoly Patko’s Still Life with Lilies and Blue Hat. I love Taylor’s understated writing and, according to the blurb on the back this is her ‘subtlest and finest work’, so I can’t wait to start reading. 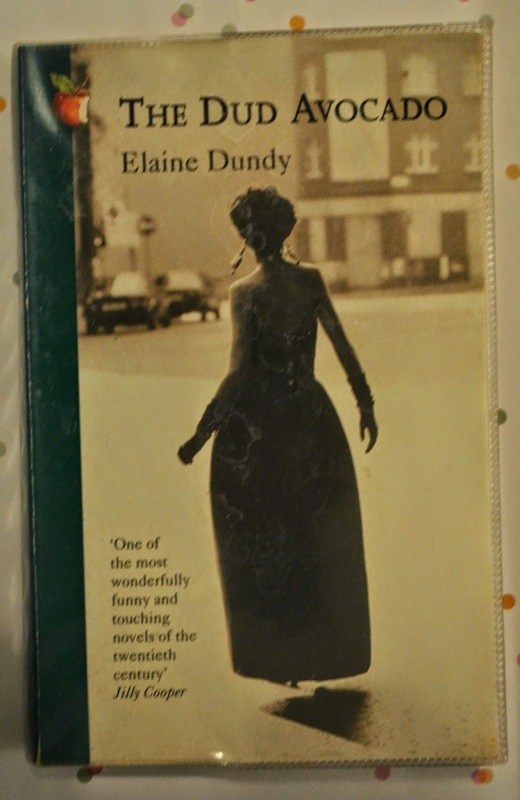 Then there’s The Dud Avocado, by Elaine Dundy(another Virago Modern Classic). 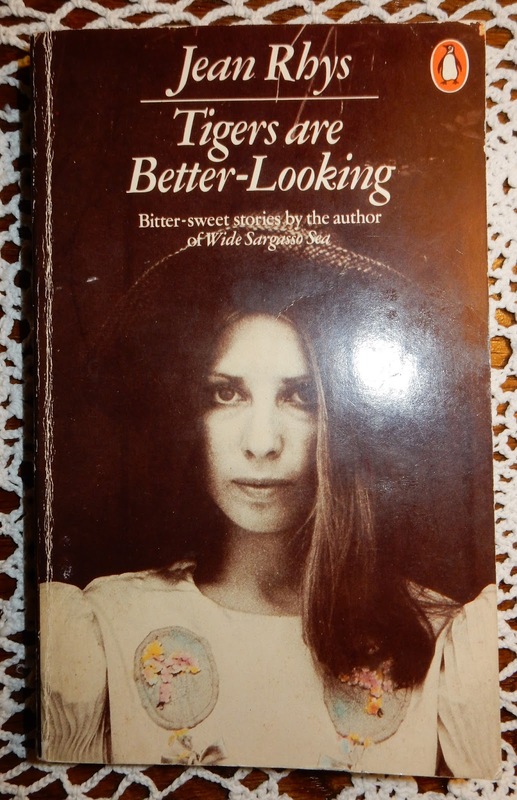 Apparently, it’s a rite of passage book and its heroine, Sally Jay Gorce, is a woman with a mission. 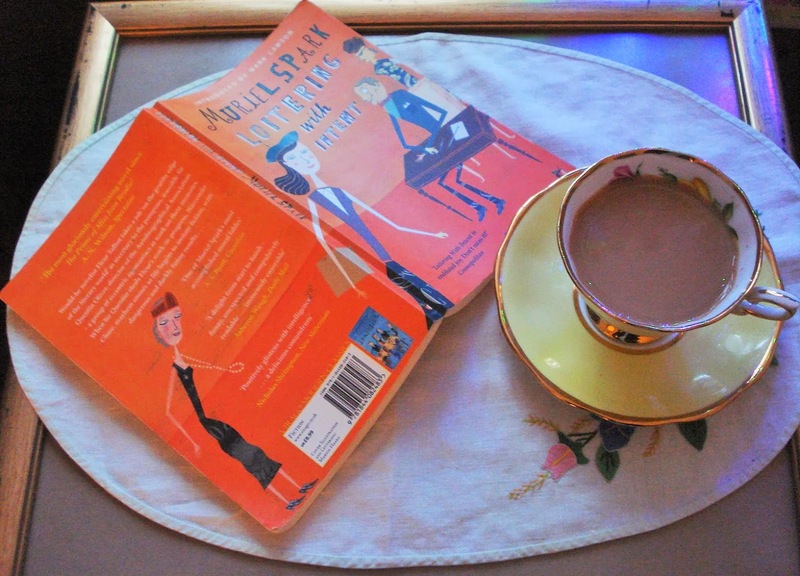 To quote from the blurb: “It’s the 1950s, she’s young, she’s in Paris, she’s dyed her hair pink, she’s wearing an evening dress at eleven o’clock in the morning, and she’s seldom had more fun.” Has anyone read this, and is it as good as it sounds? 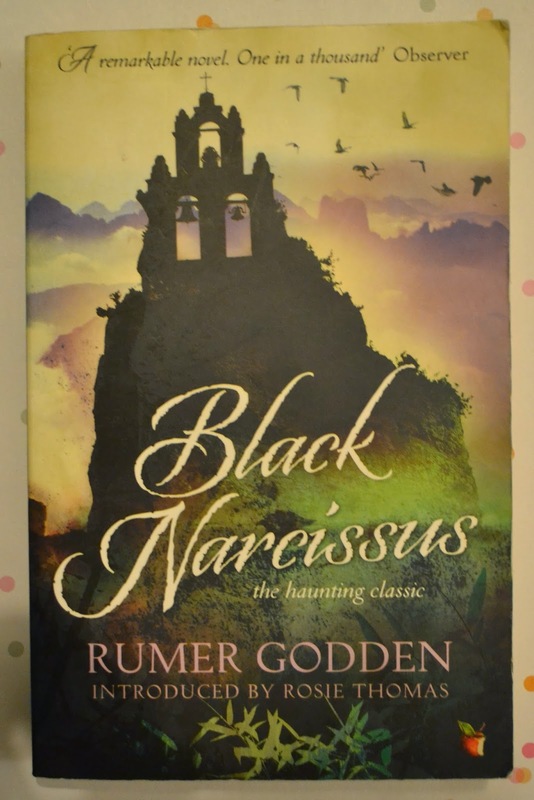 And I found Rumer Godden’s Black Narcissus, which I’ve been hunting for for ages. Godden is one of my more recent discoveries, and I’ve really enjoyed the books I’ve read so far. This was famously made into a film starring Deborah Kerr, so I suppose most people know it is about a group of nuns who establish a convent high in the Himalayas, but tragedy ensues when hidden passions surface. Virago again I’m afraid – though I’m not sure why I feel I should apologise. I like Virago. 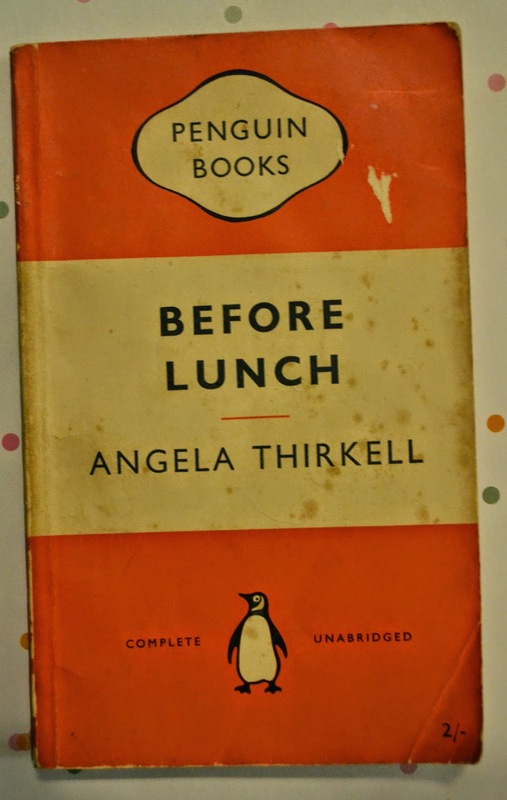 Finally I bought Before Lunch, an Angela Thirkell novel that I’ve not come across before – and no, this one isn’t Virago, it’s a 1954 Penguin (number 852) and it originally cost two shillings (old money). Just think how many books I could get if they were still two bob each. Actually, these aren’t the only books I bought this week, because when I was in the shop on Saturday I remembered I still had to pay for one about Chaucer, which I left on the shelf above the desk some weeks back. 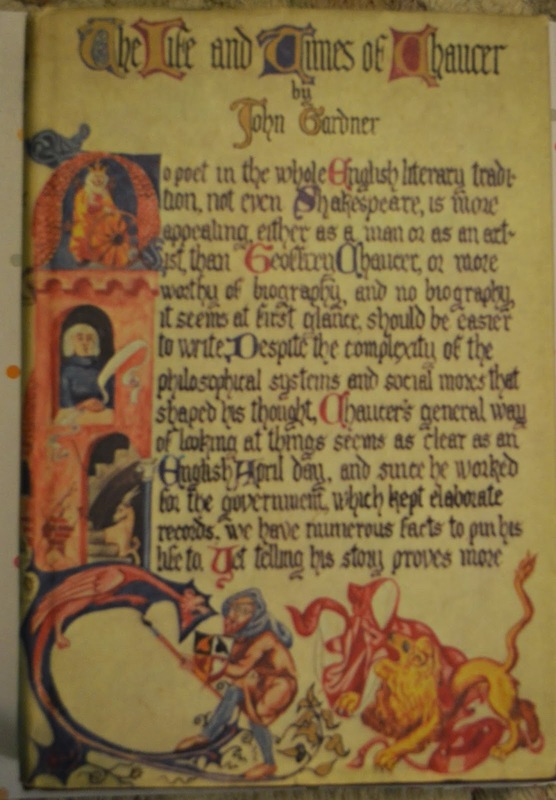 I succumbed to John Gardner’s The Life and Times of Chaucer because a) it has such a great cover; b) I rather like Chaucer, and c) I don’t know anything about him. 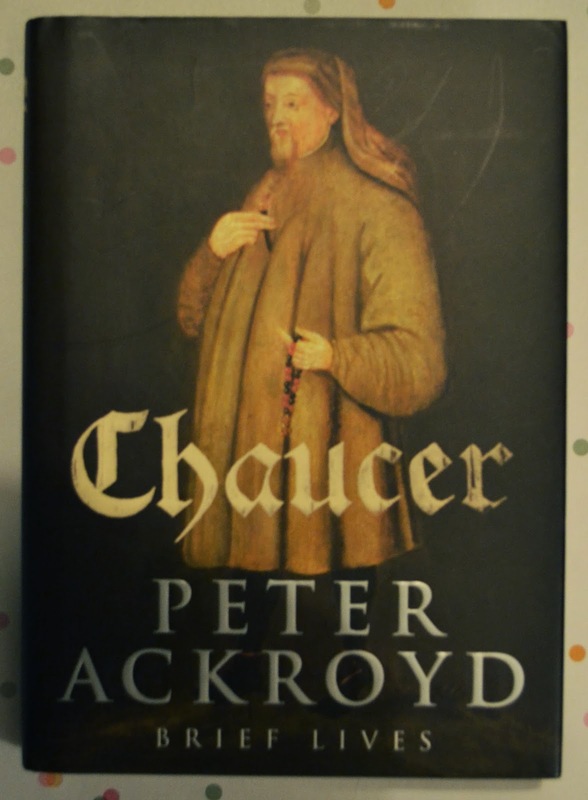 Having sorted that out, I then plucked Peter Ackroyd’s Chaucer from a box, which seemed serendipitous, and I thought it would be interesting to read alongside John Gardner, and it’s such a slender volume it won’t take up much space, so I bought that too! So much for my efforts to limit the number of books coming into our house! In six days I’ve bought six books, and even with my limited mathematical ability I can see that equates to a book a day, which is a little worrying. If I carry on like this think how many books I’ll have acquired by the end of the year! Where would I put them all? And when would I ever get round to reading them? Does anyone else out there get seized with this compulsion to buy books – and if so do you give in, or do you manage to resist temptation? 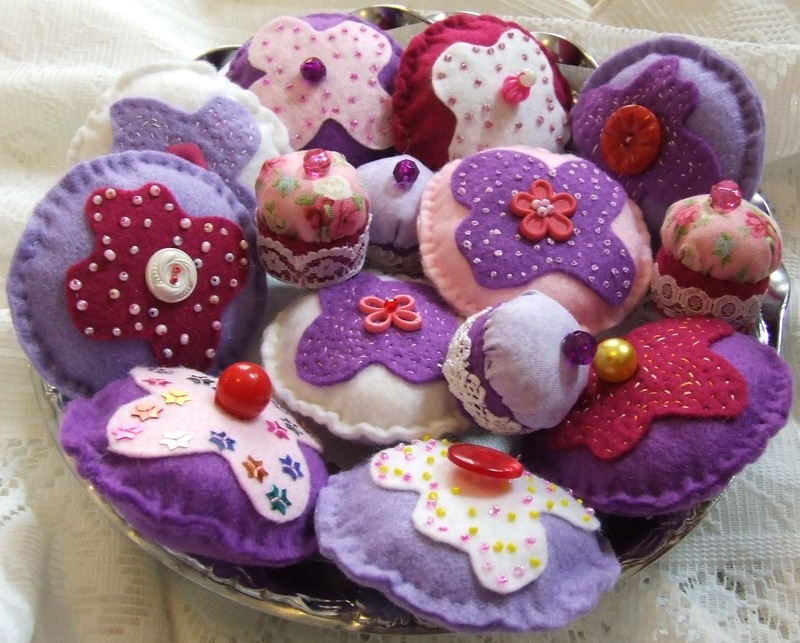 Cupcake heaven – stitched and baked! And now for something completely different. Cup cakes! I have been making edible and non-edible varieties. The ones intended for consumption came courtesy of a recipe in The Hummingbird Bakery Cake Days: Recipes to make every day special, by Tarek Malouf, which I came across when I visited a friend who had been given a copy for Christmas. It really is a beautifully produced book, with wonderful pictures, and some lovely ideas for cup cakes, muffins, and something called whoopie pies, which I hadn’t encountered before. Conversation came to an end while I copied some of the recipes and sampled her Coca Cola cakes. 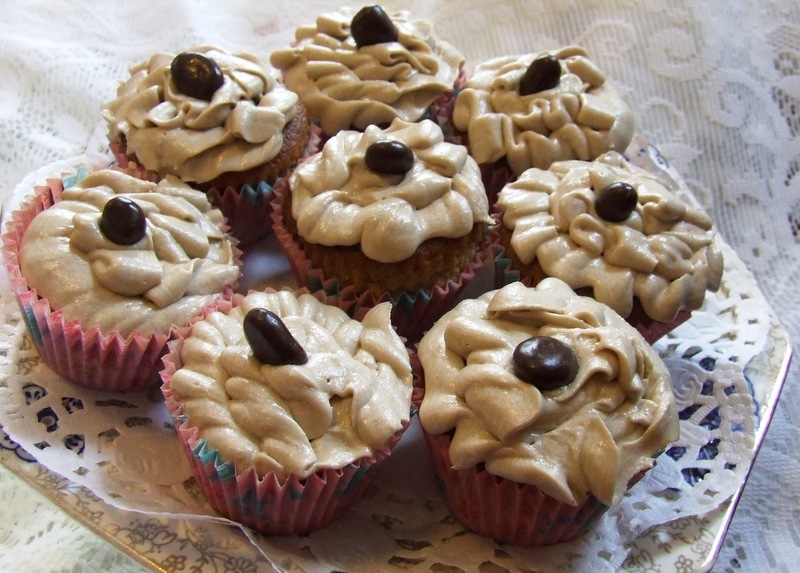 My cup cakes – next time I’ll use a recipe from an old book. Today I finally had a go myself and the cakes are wonderful, but the icing was too runny, so I added more icing sugar, and it ended up much too sweet and not the right texture, so I tried piping it on to the cakes, to see if it improved matters, but it didn’t. Anyway, I topped them off with carob-coated raisins rather than the suggested Coca Cola sweets, and I am sure they will get eaten. And lovely though the Hummingbird book is, some of the recipes look a bit fiddly for what my mother scornfully refers to as jumped-up fairy cakes, and I haven’t even tried her with whoopie pies, which appear to be a variation of the sponge drops she used to bake for my brother and I, sandwiched together with buttercream or home-made jam. 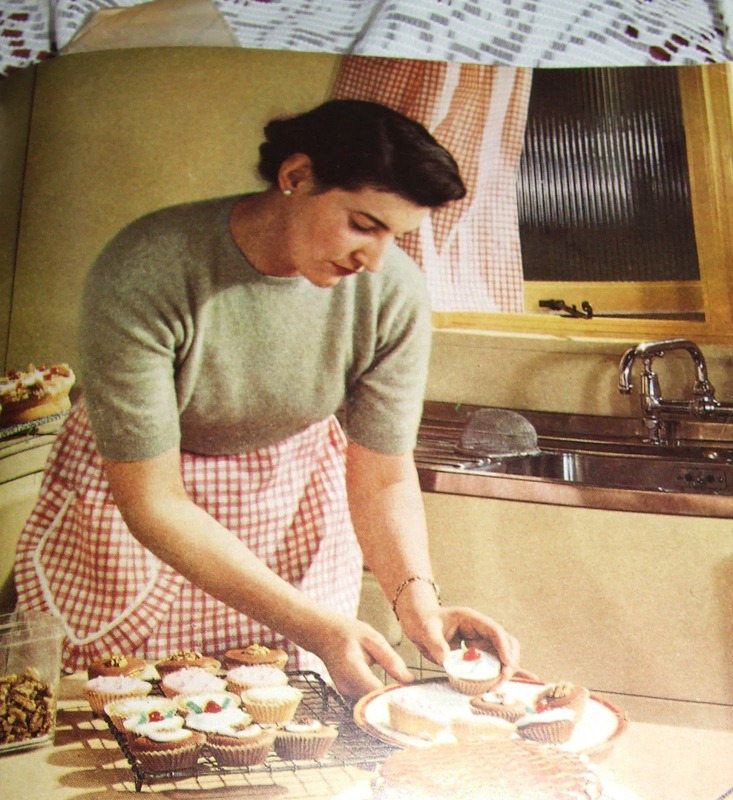 Anyway, I’ve ended up sitting reading the Good Housekeeping Cookery Compendium, published by Waverley in 1954, when my grandmother bought it as a present for Mum, and she gave me when my father died. It may not have the allure of modern celebrity cookbooks, but it’s packed with basic information; fool-proof, fail-safe recipes, and scores of pictures, including some in colour, and it’s one of the books I fall back on time and time again when cooking. 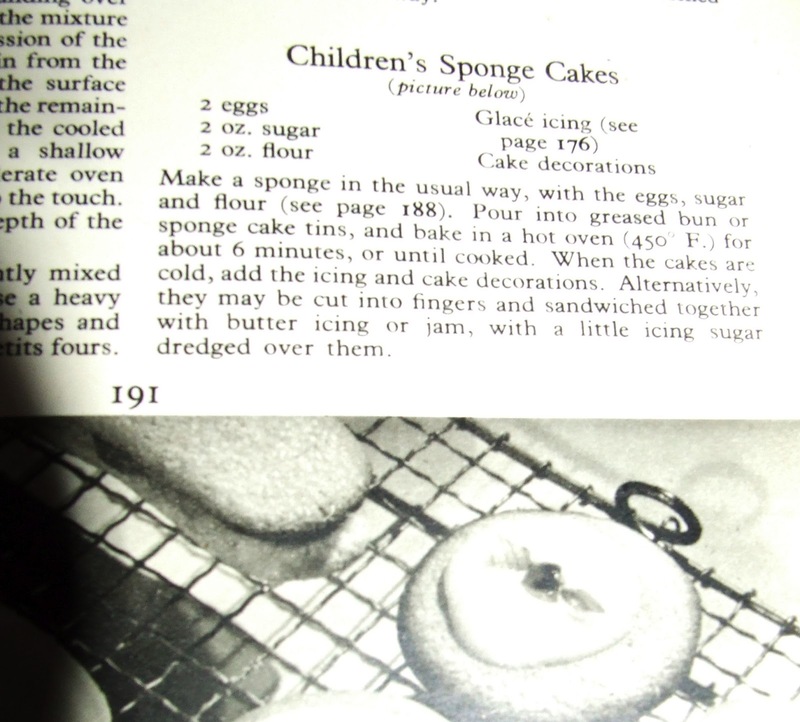 It’s not just the recipes that I find so appealing, but the association with childhood. As I turned the tattered pages today I swear I could smell ginger biscuits baking in the oven, and egg curry on the stove! 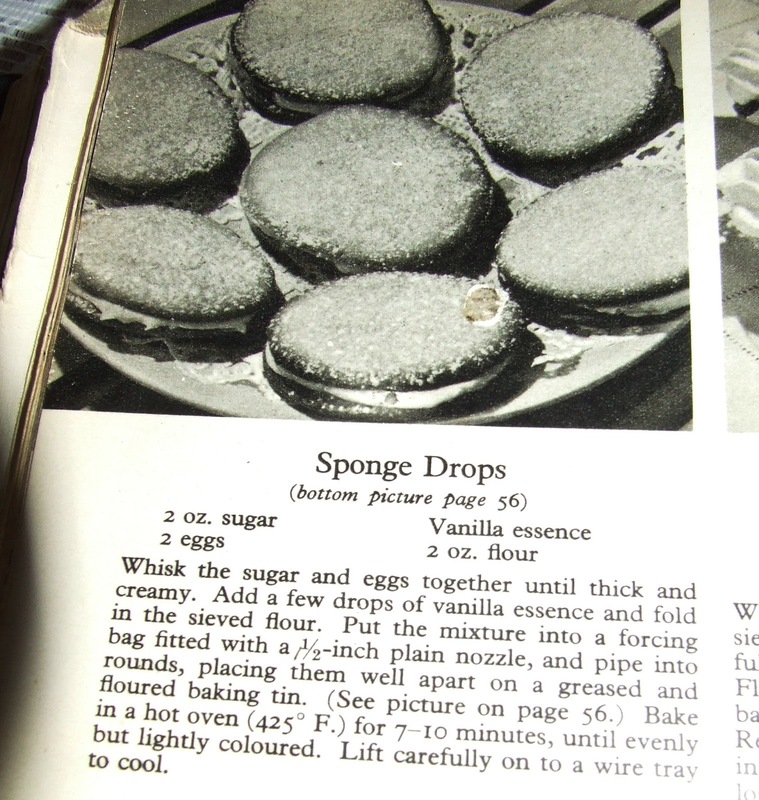 And it made me recall my very first efforts at cooking, when I was so small I had to stand on a chair to reach the kitchen table – and the evidence of a terrible accident involving an egg can still be seen on the opening pages of the section about small cakes (queen cakes, assorted kisses, honey buns, melting moments and chocolate cakes). 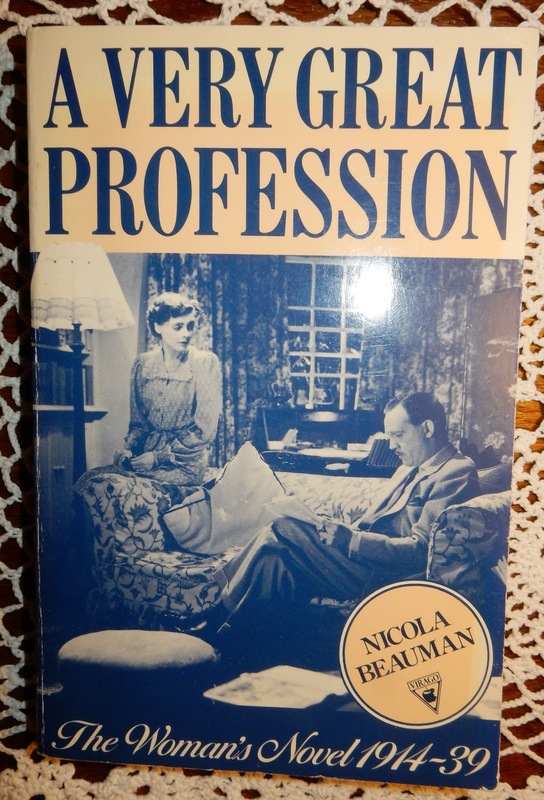 Oddly enough, a pristine copy of the book was recently donated to Oxfam Books and Music, in Lichfield (where, as I’ve said before, I am a volunteer) and I did wonder if it was time to replace the old copy, but it wouldn’t be the same because it wouldn’t have that connection with my past. whoopie pies, which really intrigue me – it’s such an odd name. And talking of Oxfam leads me to the non-edible cupcakes. 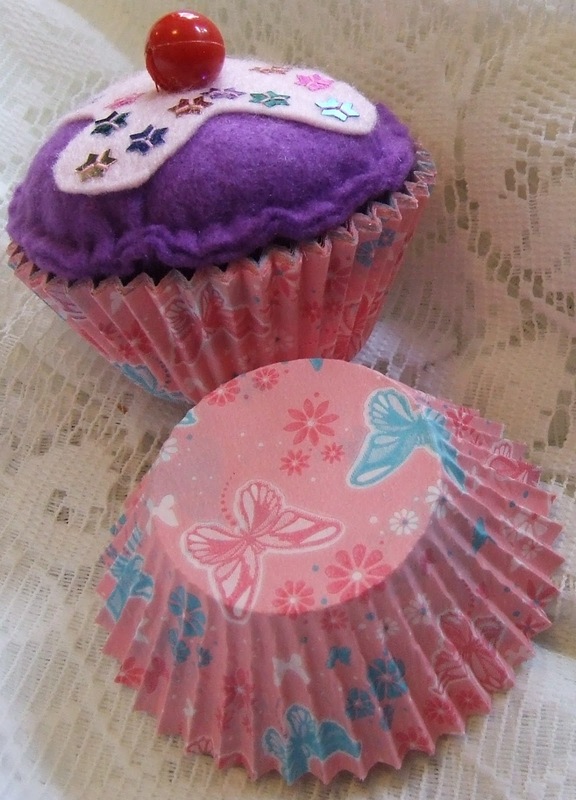 I have been stitching them in pink and purple felt, as requested by a fellow volunteer who is also busy sewing. 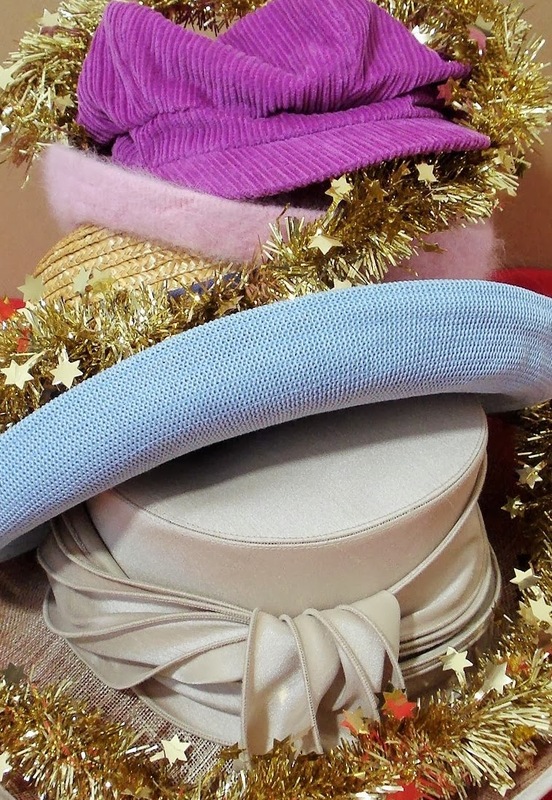 Decorated with beads, buttons and embroidery, they will make the window look decorative for International Women’s Day on March 8 – and we also hope to sell a few (they make nice pincushions) and boost Oxfam’s funds. and it looks quite eye-catching.